What a beautiful summer we've had in the Pacific Northwest. We usually get a bit more rain, and a bit less heat, but it's been fine with me, I love warm weather, and sooner or later, the rain's coming. And I'm getting ready to get my studio cleaned up, make it cozy and inviting so I can hide away in here and work. I have so much work to do, getting some treasures I've found listed on Etsy, doing some projects, getting geared up for baking. As I was sitting at my desk, day dreaming a little, I'm looking outside and noticing how early the maples are turning gold, how dry the lawn got so early. Everything's been that way. But it's beautiful. Besides the scenery outdoors, I was enjoying a little project I did last year, kind of a whimsical set of papier mache sailboats with tattered sales. 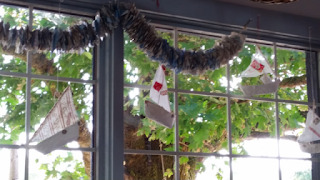 I hung them in my window, and the float along in the breeze as the maple leaves flutter. I didn't plan it this way, but, see the little banner above the boats? My daughter did this project with her kids. It is actually little squares of world maps, strung on a piece of twine. 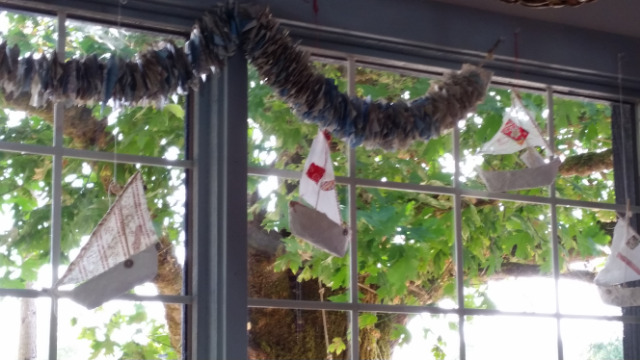 When I hung these together, I didn't think a lot about it, but isn't it fitting that my boats sale around the world under the banner, and through the rustic old tree branches at the window I get to sit and look out of when I work. I think I'll leave it awhile, it inspires me! Greetings from the sunny state of.....Oregon???? In February??? 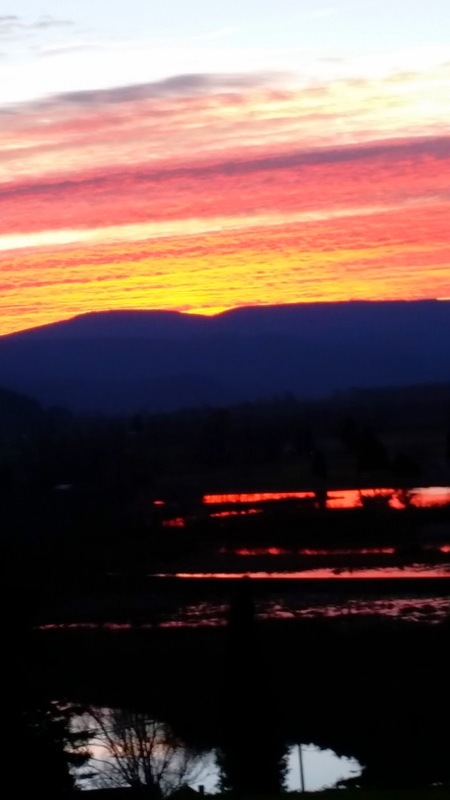 While we hear of the terrible snows they are having in the East, we, here in NW Oregon, and SW Washington, are having some beautiful weather. A few weeks ago, days of torential downpours, probably like a lot of non-Oregonians think is always the case (but it isn't THAT extreme). Potential flood watches, etc. So, I guess we can figure, we got our rain all at once, and now? An early spring? Well, we can hope! I have managed to till my garden, which NEVER happens this early! We've been having some beautiful sunsets to end our days, too. This photo is looking to the west, towards Astoria, down the Columbia, and the Pacific Ocean, not far from us. 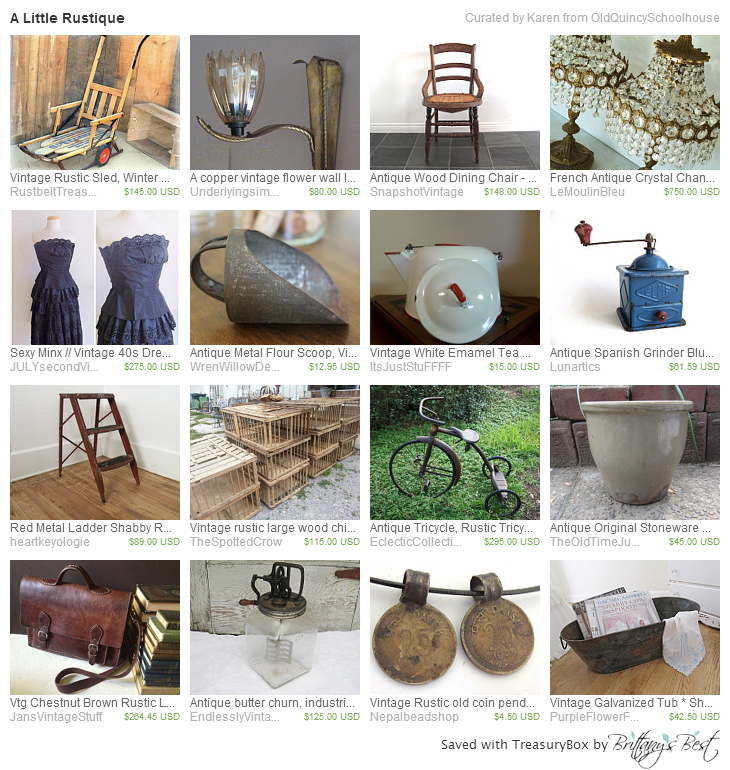 It was a very busy winter for me, baking, doing bazaars, and a vintage sale (that I forgot to mention earlier). By the time Christmas came, I was quite ready for a break from baking Cardamom Bread! I'm looking forward to spring, to gardening, being outdoors all day, to enjoying family times around the outdoor fire, and to GARAGE SALE season! 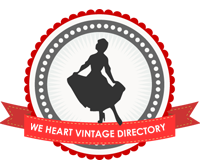 It's starting up, and as every vintage addict knows, it's a race to find that awesome item. 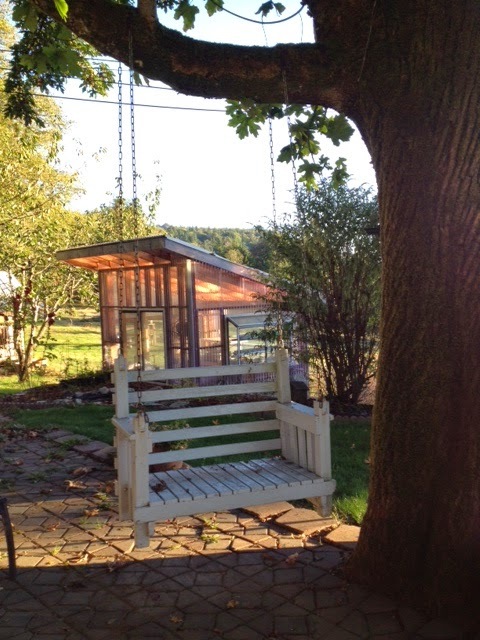 I know I've mentioned I love gardening, and if I can't be outside, I'm often reading and searching for ways to make my garden better, easier, more productive. I have been You-Tubing worm beds! I've never had a worm bed, although I can remember my dad having a night crawler bed (for fishing) when I was young. Well, yesterday, with one of my boy's help, I got a worm bed built out of totes! I'm anxious to get the worms, their house is all ready, and I'm so excited to give this a try. Sometimes Youtube can be addictive, and make everything look so easy, when it isn't. But it's always fun to learn! What else have we been doing? We have been celebrating births of our two newest grandchildren, and we got one of each!!! How cool is that! We've had our share of heartaches, and friends who we've struggled along with, with their own hard-life situations, but I don't think any of us would give up a day of our lives, the hard days or the easy days. The Lord has been faithful in it all! 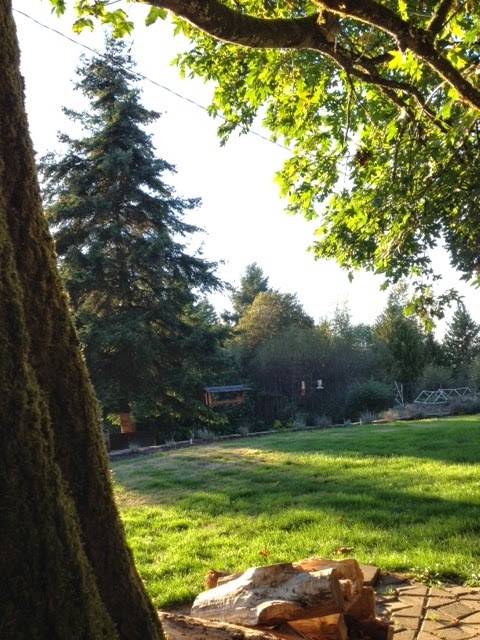 Well, we may have had an extraordinarily nice summer, and the first of fall was gorgeous, but for the past week it's been a downpour and right now, we are in the midst of a windstorm. In fact, we NEVER have things like tornadoes, and do you know, across the Columbia River into the city of Longview, WA, they had a tornado! And right at that time, my son was in a man lift, fixing a roof on a building when it hit, and tore off MORE of the roof! Weird weather. But nice. As long as everyone is safe, bring it on ;-). So, today, since we're having such stormy weather, the Junk Alley girls, near Astoria, were having a sale. And of course, we had to go. But I am soooooo glad I did! Can you believe what I found? It's a wooden ship (toy?? ), pretty heavy, and pretty rustic, but oh, so awesome! I snatched it up, along with a few other things, of course. Look at the detail that went into it, the tole painting on it! Definitely riding in the car with my dad, hyrdoplaning in the water on the roads??? I don't know, about that, but I did make it home! The boat definitely wouldn't have gotten me here. My entire spring and summer I spent outside. No kidding, until dark, I was outside, just loving the weather we had here in Oregon. I'm not one bit sorry, but I'm making up for lost time now, on the inside! I got the carpet shampooed, with the help of my sons, and I'm seriously thinking I'm going to tackle waxing my wood floor, too, but...it's supposed to be sunny tomorrow. I think working indoors should be illegal on a sunny day ;-). One thing that got seriously neglected, was my Etsy shop. During the summer, I could just not force myself to go in and work! But now that our weather is starting to turn, I'm spending my rainy days in my studio, getting stuff listed, (I can't believe how much stuff I have stuffed!) Making up for lost time! I'm just loving this little place my husband made me! Nice and bright, next best thing to being right outside! So, in my effort to get back to work on my shop, I came across the neatest tool, if you're at Etsian, you'll love it if you don't already use it. I'm on a few Etsy Vintage teams, and one of the "rules" are that you need to make at least one treasury a month. I love to look at other people's treasuries, but I don't always have time to make my own. WELL, I came across this really neat tool that you use on your desktop, with Chrome. Treasury Box!! If you don't have it, get it! You can make a treasury so fast, you'll actually have time to work on listing ;-) Here's my latest treasury, what a lot of fun it is now! Don't pay attention to my grubby shoes. See the hand reaching for my peas? That was my lil' granddaughter crawling between my legs while I was picking, stealing my peas lol! That's ok, she lives in a condo; she needs to play in the garden! 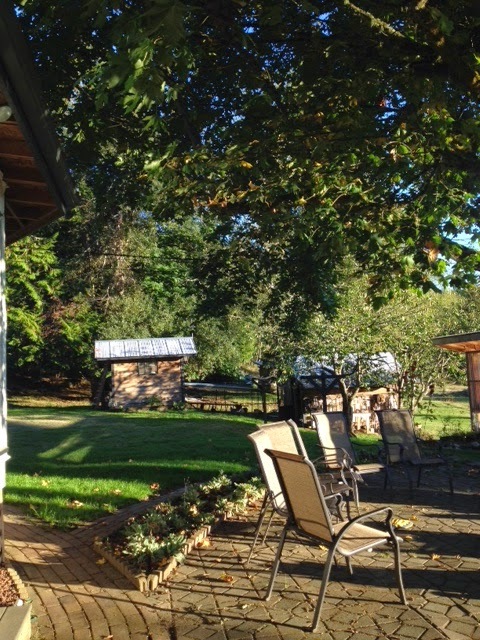 I have said all summer, and now fall, I can't believe what beautiful weather we are having here in the Pacific NW! My garden was THE MOST FUN ever; I'm STILL getting peas out of it! I've never planted late before, but what a nice season we've had. However...they're calling for rain. And it's supposed to continue for a few days at least. Gosh, I'm almost not used to it anymore! You talk to someone who doesn't live in Oregon, and that's what they say, "I couldn't live there, it rains all the time!" Well, our well-kept secret is that isn't always the case, and our beautiful days and really gorgeous. Even our rain can be cozy, it's all in the outlook. Some of the stuff I've been scrubbing! What I have to look forward to each fall, is a huge maple tree dropping leaves all over my lawn, raking many times, then starting all over again. It brings back memories of other years I've done this, but having huge piles and letting the kids jump in them. The good thing about this many leaves, my garden loves them! So now that it's turning cooler at night, it's getting to be that time to sit around an outdoor fire, sit on the tree swing, and just be blessed of all that's gotten done, plan what else I'd like to get done, and relax a little. Happy Fall! My little Etsy shop has not had the attention it usually gets, so now is the time to spend listing more treasures I've found, and also getting ready to bake Finnish bread fir bazaars! Can't believe my first bazaar is actually the day after Halloween! Crazy how it flies by! And before I close, thought I'd show this little clip of an adventure I took with my niece and my sis, to New Orleans. I never thought I'd get that close to an aligator :-) Her video went viral this summer! Did you shop til you dropped this weekend? Actually, I didn't feel at all like braving crowds. We've had a pretty lazy weekend, my husband has found time to do a couple of maintenance projects, but mostly, we've just enjoyed the holiday. We had all our kids and the grandkids together, as well as my parents. Just making memories, eating, talking, laughing- we even put a puzzle together! I'm thinking I need to stock up on puzzles this winter. My shopping is going to be minimal this season. I have had years where I went overboard, but this time, I want to keep it very simple. The part I am really looking forward to, is the simple things. We are planning an evening Christmas song-athon at the little church down the road. Inviting friends to potluck, to bring their instruments and voices, and have a good old-fashioned time. For years, I've wanted to host "Game Nights" in the winter. Doing these kinds of things, our kids and grandkids love, as much as all of the grown-ups. This IS going to happen this winter! And another activity I enjoy with my mom, sister, nieces, daughters and granddaughters, is "Craft Night". We haven't done this in a long time, but basically, getting together to work on whatever art or craft project we each have, and doing it together. We don't always get a lot done, but we have a lot of fun! These are the kinds of things I'm wanting to do! And they don't cost much, you have to eat dinner anyway, so why not just share? I'm sure that sometime REALLY close to Christmas Eve, I'll manage a panic Christmas shopping trip, searching for that elusive, just right gift, but, unless an idea comes to me, I'm not going to let it stress me out any earlier! Enjoy your friends and family, and have some good times this season!